The Wight – providing fantastic service, delicious food and great facilities, an ideal location for your holiday or short break on the beautiful Isle of Wight. A choice of 41 unique and comfortable bedrooms await you at The Wight. Varying in style and size from singles through to family suites, superior rooms and a four poster and honeymoon suite, we are certain you will find a room suited to your requirements. Every room has en suite facilities, colour TV (flat screen with freeview and radio), hospitality tray, hairdryer, digital safe and tower fan. All rooms have been redecorated and fitted with blackout curtains and new carpets to ensure your comfort. Free WiFi is available in all public areas and the vast majority of bedrooms to compliment your leisure time. The Wight does not have sea views but is set in quiet and secluded grounds of 2 acres including a large private car park. After a two minute gentle stroll you will reach the sea, Sandown beach and local shops. The perfect location for enjoying all that Sandown has to offer whilst avoiding night-time noise from the High Street and Esplanade. We are confident that come rain or shine, The Wight’s many in-house amenities will guarantee the enjoyment and success of your holiday. Our heated indoor pool, jacuzzi, sauna and steam room will leave you feeling relaxed and rejuvinated after a stay at The Wight. Spa treatments are also available at our Oasis Spa which offers massages, facial treatments, beauty treatments and manicures for those keen to feel pampered. 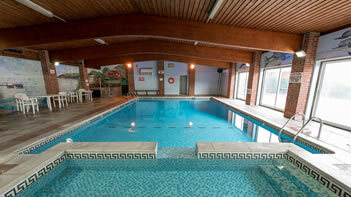 For our more energetic guests, we have a small “keep fit” room, a games room and a dedicated snooker room. For a break that offers all the benefits and style but without the normally associated high cost, The Wight is the place to be. 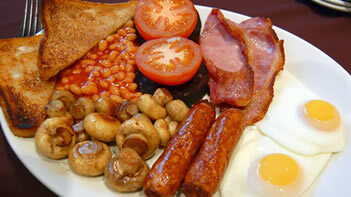 The Wight offers one of the best breakfast menus available on the Isle of Wight. Whether you prefer a full english, a continental, a vegetarian or a fish inspired breakfast, we are certain you will be more than satisfied. 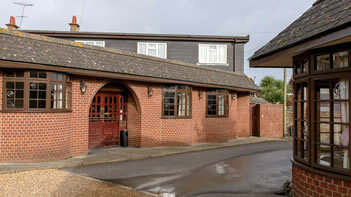 Our friendly and efficient staff and management team are looking forward to welcoming you to The Wight. Click here to read the latest reviews left by our guests. Our aim is to provide great service, fantastic food and to give superb value. Book direct via this site (or telephone/email your enquiry) and you will not only get the guaranteed lowest room rate but also we will then subsidise your car ferry! The Wight is always in the top 10 of Tripadvisor’s “best value of 433 places to stay on the Isle of Wight”. guaranteed lowest room rate but also we will then subsidise your car ferry!